In the famous Ian Fleming’s series, James Bond, an operative of the Her Majesty’s Secret Service, had a code name“007”. The 00 suffix according to intelligence parlance stands for the “License to kill”! James Bond is authorized to kill in the name of Her Majesty for the sake of Great Britain. Well, we have a similar license issued to the Security Forces, called the AFSPA! They can kill, destroy and do all sorts of things in the “National Interest” and their actions are beyond any adjudication. The legislation which stands for Armed Forces Special Powers Act was enacted in Kashmir in 1990 at the start of the militancy. The Act is called, “The Armed Forces (Jammu & Kashmir) Special Powers Act, 1990 No. 21 of 1990.An Act to enable certain special powers to be conferred upon members of the armed forces in the disturbed areas in the State of Jammu and Kashmir”. It would be useful to reproduce certain clauses of the Act to show how severe and totalitarian it is. The Act empowers the Governor or the Central Government to declare any area as disturbed even though Law and Order is a State Subject. The Governor of the State or the Central Government, may, by notification in the Official Gazette, declare the whole or any part of the State to be a disturbed area”. The Act further authorises any Commissioned Officer, Non-Commissioned Officer, and Warrant Officer or any other officer of equivalent rank in Armed Forces to use force even causing death, destroy a dwelling, search any dwelling without warrant, and arrest any person without warrant. He is also authorised to search and seize any vehicle suspected to be used for unlawful activities. The power to search includes power to break open any door, lock, almirah or any other box or so if the key for the same is withheld. In brief, the security forces have total powers to act as they like if they suspect any “anti-national” activity. In fact, these powers are not even exercised by an occupying force in a territory conquered by them as a result of war. In such cases, they are covered by Geneva Convention. Here there is absolutely no legal protection or remedy to the aggrieved! On the contrary, the worst partis regarding legal protection given to the persons acting under the act. The article 7 of the Act reads, “Protection of persons acting in good faith under this Act :- No prosecution, suit or other legal proceeding shall be instituted, except with the previous sanction of the Central Government, against any person in respect of anything done or purported to be done in exercise of the powers conferred by this Act”. This is the most totalitarian clause giving indemnity to one and all in security forces doing whatever they feel to do in the so called “National Interest”! How does one know what is “Good Faith” and how one can judge whether a person has truly acted in “Good Faith” as his actions are not allowed to be adjudicated! There is nowhere in the world such a draconian legislation! 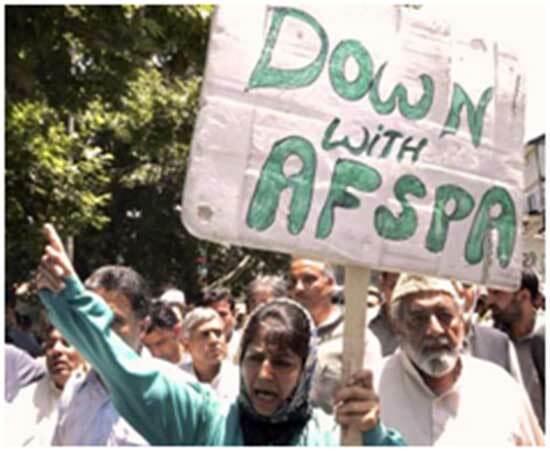 AFSPA has been in force in Kashmir for last 28 years! What has been its fallout? The Government estimates of casualties during the militancy of the nineties of last century are over 50,000 dead. Thousands injured and maimed. The unofficial figures put the dead over a hundred thousand. Apart from this 10,000 are still supposed to have disappeared without a trace! Women have been raped sometimes en masse. Property worth crores has been destroyed without any accountability. This has all happened under the infamous Act AFSPA in the “National Interest”. There are some typical episodes where even the guilty have been identified and attempted to be prosecuted but escaped punishment under the garb of this Act. The typical instance is of Pathribal. The case was investigated by CBI who wanted to challan the accused. However, the Supreme Court of India intervened and did not allow prosecution under a civil court and handed over the same for Court Martial to army who let go of all the accused. There are innumerable other cases of massacres, rapes, destruction of property by the Security Forces which could not be investigated or subjected to judicial scrutiny because of AFSPA. Kishalay Bhatachajee in his book, “Blood on my hands- confessions of staged encounters” has given detail of what all has been happening under the patronage of AFSPA in Kashmir. It gives vivid details of what some of the officers had been doing especially about fake encounters. That was the past, now the present is much worse as the security forces are now on a mission of kill and destroy without asking any questions. Allegedly, they have Mossad Advisors who are following the strategy used by them in Palestine. Search, locate, kill and destroy. However, in Kashmir there has emerged a new kind of militancy. Few armed militants are helped by thousands of unarmed people where ever the security forces go to locate and kill them. This has been resulting in mayhem and a blood bath of civilians. Civilian casualties are more than the militants killed. Instead discouraging militancy, it is being glamourized and very well educated people are getting involved. On killing of one militant, there are 30 others ready to join. This strategy is not going to end violence but on the other hand it is increasing and involving all sections of the society. Almost all right thinking people have opined that the only way to end violence is to start talking with one and all for a political solution of the problem. To enable that the first and foremost thing is to repeal AFSPA and allow total freedom of expression. The sooner it is done, the better. The alternative the present blood bath in Kashmir engulfing the entire sub-continent!